The Spinata Grande slot machine is instantly playable in Oranje Casino and developed by the well-known casino software developer Netent. The game has a cheerful and festive theme, because everyone is welcome at the Mexican party that is celebrated with piñatas. The introduction of the story begins with a box full of packed piñatas that then hang in the air. The game is equipped with five reels and four rows with no less than forty paylines and can also be played on a tablet or smartphone if desired. The symbols are of course partly formed by real piñatas and supplemented with other symbols, such as letters. Colossal symbols In the game of the Spinata Grande slot machine, the symbols are also available as a colossal symbol. That means that in that case a symbol consists of a block of two times two symbols or a block of three times three symbols. It is possible that only a part of a colossal symbol can be seen, because that depends on the position on the reels. Another feature of the game is that not only in the regular game, but also during the free spins all other symbols than the colossal symbols when stacked symbols appear on the reels. This combination naturally offers excellent prospects of dropping a winning combination. If there are free spins, only collosal symbols are used, just like the colossal wild and the three times three versions of the animal symbols that represent a pinata. A colossal wild is formed by a block of three by three symbols and comes only for during free spins on the middle three reels. All symbols are replaceable with the exception of the bonus symbol. The best possible combination comes with the special wild to payout. The bonus symbol consists of a block of three by three symbols and can also appear during regular game play just like during free spins. The moment a part of the bonus symbol or the entire symbol is visible on the reels, the mini slot bonus game is played. 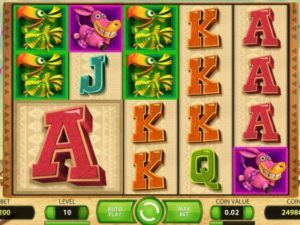 The mini slot game is a separate game within the game of the Spinata Grande slot machine and this game also has a number of symbols, such as extra spins, free spins and various coin symbols. A bronze coin is awarded with a prize of twenty coins and with a silver coin the price is forty minutes. Eighty coins are won on a gold coin.